As the night grows darker from November, the phenomenon «Aurora borealis» shows itself in the sky throughout the winter in the Arctic until April. With is many myths, and magical superstitious powers, it has been viewed upon for decades of people from the north. If we are lucky, we can gaze at the sky with a dansing Northern light above us, as we cruice around comfortably together in our minibus. Our proffesional guides will teach you about the light, the destination you visit, help you with adjusting cameras, take the best photos and in the end get you safe home. All our tours have both one driver and one guide. We will also take photos and share them with our guests from each tour. With a small group we are flexible to move if the light appears suddenly somewhere. There is no manual as to when or where it will appear – that´s what makes the hunt so exciting. But we can ensure you a night to remember. We also serve you a hot expedition meal with warm beverage on the way. It is recommended that you bring warm inner layers like wool, fleece, down, and more wool (the absolute best). Remember the camera. For departure, meet at Arctic Adventure Center in Storgata 78 in Tromsø. Please be there 10 min before your departure. Pick up: Meet at Arctic Adventure Center in Storgata 78 – 17:20. Introduction and dressing: Our Northern Lights guide and driver will meet you at the store, give you information about the hunt and dress you up with suits and boots. Hunting the lights: As soon as we are ready we head out to hunt the lights. Location will vary after weather conditions and the kp-index for lights. Tromsø area is big and with islands, fjords, mountains and even Finland as our neighbors we can end up anywhere. This makes the tour even more exciting as we will see more of the beautiful Norwegian nature. Drive home: After some hours in field and when you feel ready, we head back home to Tromsø and the Arctic Adventure Center. The Northern lights occur because of collisions between electrically charged particles from the sun that enter the earth’s atmosphere. The magnetic poles of both North and South attract the particles which we see as lights. The Northern light is also known as Aurora Borealis. The lights appear most often in colors as green and pink, but can have shades of red, blue, yellow or violet. It´s no doubt that the Northern lights are one of the most beautiful nature phenomena we have in the world. Watch the video below. It´s created by the Univeristy of Oslo and you will learn how the Aurora Borealis work in practice. Why watch the Northern lights in Tromsø? Tromsø is situated on 69°North and is a pole position regarding the Northern lights. The town is easily accessible by plane, have nice hotels, a lot of tour operators and are surrounded by an amazing wild nature where you can experience the lights. When you decide to watch the Northern lights there are several things to consider. Up here in the North we have the midnight sun during summer and polar nights during winter. To be able to see the light you need dark nights and clear sky. Below is a list of the months which it´s most likely to have visibility to watch the lights in Tromsø. The activity from the sun will also vary, so to check the Northen Lights Forecast is also important. You can of course watch the Northern lights on your own. It´s up on the sky, it´s free and accessible for everyone. But to get the most out of your Arctic holiday and haunt for lights we recommend you to join a guided tour. Then you will have a guide and driver with expertise and experience in when and where to find the Northen lights. To be able to see the light in a proper way you need to be a place without any light pollution from the city. And it can be tricky to catch the lights on a photo if you don´t know how to do it. We will help you to take the best pictures and teach you about the lights existence and myths. Because Aurora Borealis have an important role for the people of the North. Generations have lived with the light, it´s stories and frighten myths. 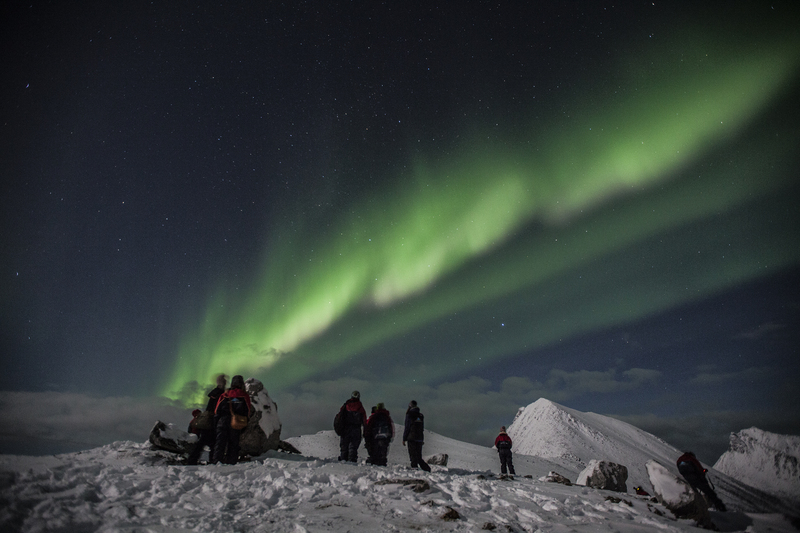 We will love to share all of this with you on our Northen Light Adventure tour. The forecast service is delivered by visitnorway.com and will be active during the season which begins in September.